Examples of modern image analysis applications: image improvement, image databases, industrial process management, three-dimensional modelling. 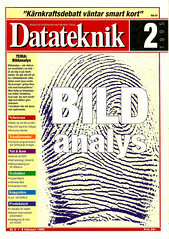 IBM image database "Ultimedia Manager", interview w IBM researcher Wayne Niblack. GOP - General Operator Processing, interview w prof. Gösta Granlund at Linköping University. Wood industry process management program "Woodeye" by Innovativ Vision, interview with CTO Per Rowa.